RockUnitedReviews: GEOFF TATE: "Kings & Thieves"
Now this was bound to be a tricky one. Geoff Tate and Queensryche get on about as well as a creationist and Richard Dawkins these days, but to be honest Queensryche have been pretty poor for a while anyway, case in point the dire “American Soldier” album. So although I used to be pretty fond of the band, I was genuinely expecting an album full of Geoff Tate with his head up his own arse singing “La la la la…. I can’t hear the criticism”. This was not, thankfully, the case. 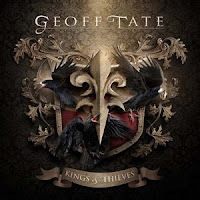 “Kings & Thieves” (guess which one Geoff is…) is an album that serves as a bridge between the classic Queensryche sound and the more plodding modern day stuff. Whilst Tate isn’t afraid to bang on about his own genius (“The Way That I Roll”), there’s also some good stuff here as well, such as the dark, sexual “Say U Love It”, which could have been a Mindcrime bonus track, with Tate showing the talent he has for menace as well as melody. Elsewhere, there some good, powerful songs, but as an album it never really gets going, never injects the spark that will keep you coming back for more. The tracks come at you at walking speed, and a bigger, chest beating production would have improved things, whereas what we have is merely adequate. There’s nothing intrinsically wrong with “Kings & Thieves”, but whilst I have enjoyed listening to it I doubt it will be calling me back anytime soon. Tate is in fine voice, full of the usual expression, and the music is strong and well played, but there’s nothing here that offers anything to get too excited about. Far from bad, as many were expecting, this is above average but nothing more. I stopped reading this as soon as the blogger called American Soldier "dire". American Soldier is a stunning tribute to the realities of war from the perspective of our soldiers. The vocal arrangements are incredible and the supporting music for this story is right on the money. QR over the last decade and a half, and Kings and Thieves requires many listens so that the brain can organize the way the compositions are layered. One can dislike any art from a subjective standpoint, but offering a decided analysis of this music so prematurely is exactly that. Premature.